Five weeks ago, a one-year-old baby elephant, Plai Boonrod fell into a ravine in the forest, while a female elephant from Laos stepped on a landmine 2 weeks ago. Both were lucky to survive, and now both are receiving treatment at the Elephant Hospital in the Thai Elephant Conservation Center, Lampang. 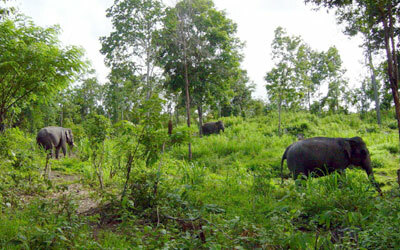 Elephant patients are allowed to stroll in the area during daytime and go back to the forest at night. The institute’s veterinarian team has been treating the injured Laos elephant (see story page 4) by cleaning the wound and stripping away the dead tissue. Krung Sri, seen here joyfully drinking water, has been under treatment for over a year and has nearly recovered from severe wounds suffered when stepping on a landmine. 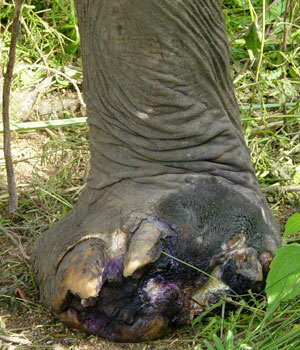 Dr. Taweepoke said that the elephant’s right foot will be partly amputated. Dr. Taweepoke Angkawanich, the hospital veterinarian and project researcher told Chiangmai Mail about the severe symptoms of Plai Boonrod. The poor little elephant has only a 50% chance of recovering completely from the paralysis resulting from its fall, despite all the hard work being done by the veterinarian staff. 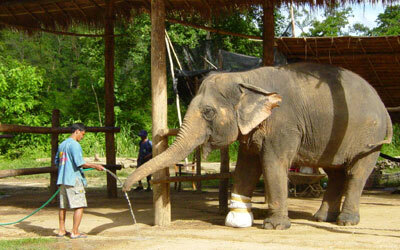 Plai Boonrod can still only move his two front legs; his two hind legs and his tail are not responding to any stimulus. Dr. Taweepoke said that Boonrod would not be able to recover from this injury in one year despite the assistance from people donating money for many remedial types of equipment. 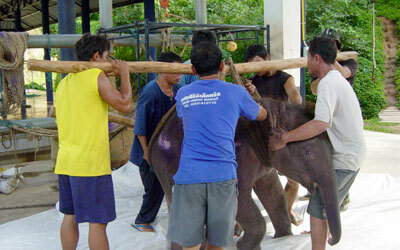 Plai Boonrod, undergoing hydrotherapy in a junior jumbo-sized sling, raises his trunk to greet visitors. 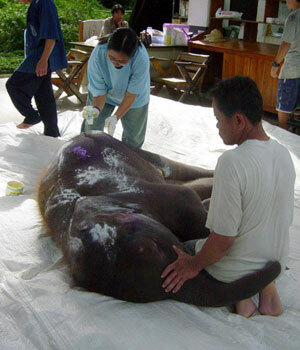 Veterinarians apply medication to the little elephant’s wound. It takes 7-8 staff to help Boonrod move to his stall after hydrotherapy. Every day, Plai Boonrod has his body showered and receives hydrotherapy. Like an innocent boy, he still does not know what will happen to him if his injuries cannot be cured. However, Boonrod loves to raise his trunk to say hello and play with everyone who visits him as if he understands people’s sympathy. Krung Sri, another injured elephant that has been under treatment for over a year, has nearly recovered from the severe wounds after stepping on a landmine. Dr. Taweepoke said that the elephant’s right foot will be partly amputated. Dr. Taweepoke also said that the other injured elephant from Laos suffered less severe wounds and should be recovered within a year. Despite their injuries, all of the elephants in the National Elephant Institute’s Thai Elephant Conservation Center seem happy. They can stroll and find something “elephantly” delicious in the area during daytime and go back to sleep in the forest at night. But the patients there always take time to play with their keepers. Just before the rainy season started the ‘Samsara Foundation’ from the Netherlands, in cooperation with Rotary Chiang Mai South, completed 3 water purification projects for 3 schools in Mae Sariang District. Posing in front of the new water tank - volunteers Ratana, Annelie, the school director Mr Kasem, Ingrid and the representative of the Mae Sariang Department of Education Mr Mongkon Kamsoen. This newly build tank will collect water during the rainy season in Baan Mae Sawan Luang. 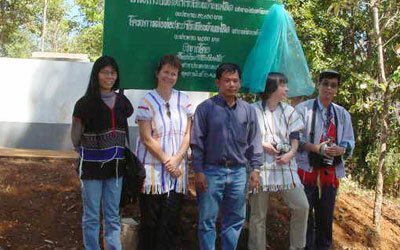 ‘Samsara Foundation’ volunteers, from left, Ingrid, Ratana and Annelie with Mongson Kamsoen, the representative for the educational department in Mae Sariang, Kasem, the director of the school in Mae Sawan Luang and the headman of the village Nakhon Priprakopkit in the traditional Karen dress at the water purification project opening ceremony. Samsara volunteers Ratana and Annelie just before they unveil the new water tank in Mae Sawan Luang. The biggest project was funded and installed in Baan Mae Sawan Luang in the mountains of Mae Sariang, where the Karen people live. Their biggest problem was lack of drinking water for their primary school. 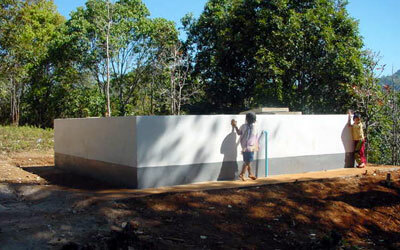 As a community activity, a large concrete tank to collect the water during the rainy session was build by the teachers and the villagers (no salaries were paid). Now, after the water is cleaned by a water purification machine, the water will go to 10 newly built taps and some sinks with taps located near the classrooms and the playgrounds. The 136 children studying at this school are now able to drink safe, clean water the whole year round. At two schools in Baan Phe and Baan Kapoeang, located in the outskirts of Mae Sariang Valley, where many very poor children go to school, we funded PVC tanks and water purification machines. At both schools the drinking water was infected. The appalling old tanks no longer did their work, and the schools didn’t have any money to renew the tanks. 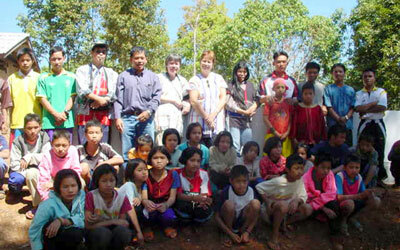 Furthermore a concrete floor in one classroom in the school in Mae Sawan Luang was paid for by Ingrid Hendriks. The red sand floor was not usable during the rainy season. And while building the school 3 years ago the village had run out of money to finish the work properly. In Baan Um Long, donations were used for a starter and 5 batteries. Now the solar panels can be used again, which will enable the TV and computer to work. 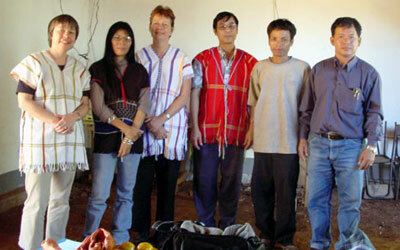 This school is situated high in the mountains and is very isolated during the rainy season. Thanks to the TV set in the school, the children have the opportunity to know more about what is going on beyond their isolated home. They are also able to follow school programs on television, which in part helps make up for not having enough available teachers during the rainy weeks. 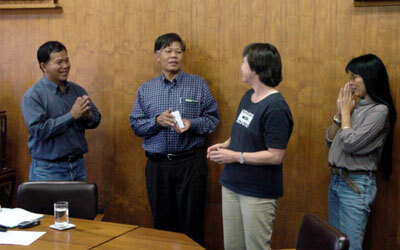 Thanom Wongkeeree, Mae Sariang Department of Education director, receives a donation from Ingrid Hendriks for the concrete floor. Khun Kasem, school director, is very happy. Everyone wants to get the first look and be in the picture - the children of the primary school in Mae Sawan Luang, their teachers, members of Rotary Club Chiang Mai South and Samsara Foundation members stand in front of the newly build water tank. 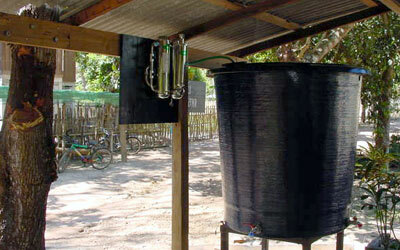 The water tank and purification system at the primary school in Baan Phe. With these 4 projects, a total of 125,000 baht was spent. 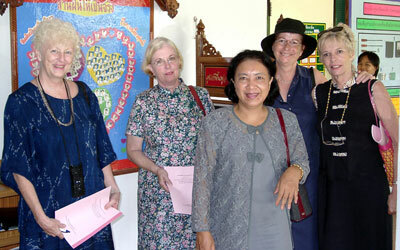 We are very impressed by the schools’ directors and by the support given by the Mae Sariang Department of Education. 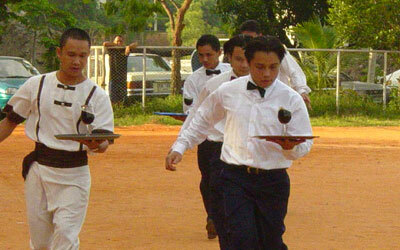 They managed to give us very detailed quotations and wrote reports about the executing of the projects. They even managed to install these 4 projects in just 4 weeks time! Over the few next years, the ‘Samsara’ Foundation and the ‘Foundation for Education of Rural Children’ in Chiang Mai would like to continue their commitment to these and many other schools in the region. They are raising funds to build dormitories, toilets, canteens, libraries, water purification machines, and electric equipment for 20 schools. They also hope to help supply a sufficient amount of schoolbooks, medicine and kitchen equipment. Needless to say, any donation is more than welcome! Nearly everyone who lives in the Chiang Mai area has heard about the “Foundation for the Education of Rural Children”, an institution seeing its mission as providing access to basic education for children in rural Thailand. Mayuree, with one of her typical smiles, talks to a trainee. On a site visit to get first hand information (from left) Renee Vines, Becky Lomax, Annelie Hendricks, Penelope Hall, and in front Mayuree Yoktree, the “soul” and director of the Yardfon Vocational Rehabilitation Center. This young man used to be a boxer but was hit on his head and lost his hearing. Despite that, he is a very bright young man, proving it by setting up the TV-computer system for the delegation of women so that they could see a professional presentation of the vocational program. Last year (2002), the foundation became a registered public charity in the United States, and a government-registered Thai foundation. The foundation dates its origin to the summer of 1999 when several American women living in Chiang Mai learned the Viengping Children’s Home desperately needing a vehicle. The Viengping Children’s Home was the first orphanage in Thailand to introduce a foster parent program where children live with families while awaiting adoption. The vehicle was needed to periodically visit the 80 children in the foster homes. And the lady, Mayuree Yoktree (Chiangmai Mail VOL II, No. 7, Local Personality) who initiated this foster program, which is now a very successful organization, moved on. She found a new niche, the Yardfon Vocational Rehabilitation Center for Disabled Persons, which desperately needs the support of caring people. People who are disabled, be it from birth or through an accident, have many disadvantages to overcome in our society. Even today it is very hard to change ‘normal people’s’ behavior towards disabilities, as well as that of some employers who do not accept their ability to lead a normal life. People with disabilities, whether physical, mental or behavioral, are human beings who also have the right to be promoted by society to enable them to survive normally on their own. Getting a job makes a disabled person proud of him/herself. Who knows better what problems occur, and how to face them, than a teacher who himself has a disability but nevertheless proves to be a positive, smart, humorous, optimistic and courageous person? Living with a wheelchair or depending on crutches does not mean one cannot live an almost normal life if there are people out there who take you as you are, and teach you to overcome the disabilities. The computer teacher happily explains to the women what is being taught at the center, while the trainees watch. The needed ‘qualification’ for acceptance of becoming a trainee at the center is quite simple. One should be between 14 – 40 years old, live in the northern region (17 provinces), be a person who is not addicted to any kind of drugs, and does not have chronic or communicable diseases. The person must also have a physical disability of the body, arms or legs, but be capable of self-help during the course. 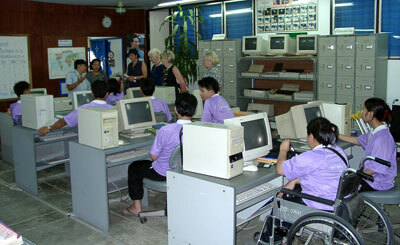 The Vocational Rehabilitation Center provides four training courses - computer & typing, electronics, arts and crafts, and making clothing. The curriculum lasts for one year starting each year in October. It includes counseling and providing advice about activities for the disabled, so they can accept their disability and be able to adapt themselves, physically and mentally, as well as become courageous to face all kinds of problems which might occur. They gain broader vision, better living skills to live a safe life in the present day community and are then able to participate in social activities, such as sports, music, campaigning for election, blood donation, as well as other normal community activities, so the general public can see that they are not different from others. To ensure that those who finish the course would get a job after being trained, they have set up a job provision center within the main center. The staff there prepares the trainees for ‘life after the course’, which is sometimes not an easy task, as many of the (mostly young) people led a normal life before becoming disabled through, for example, a motorbike accident where they lost arms or legs. They cooperate with provincial job provision offices to inform businesses to provide jobs for the disabled. They try to put the right person in the right job by coordinating with employers and employee. They follow up, in case a problem occurs, and they also give advice for financial aid to those who need it to begin an independent job. The ability to work independently is most wanted among disabled persons, this way they can manage their own work, be at home with their families and support them despite their physical disability. But here we are at the beginning again. In order to provide all that, new computers are urgently required for training these brave young adults. You cannot train people for today’s world with a computer from yesterday. 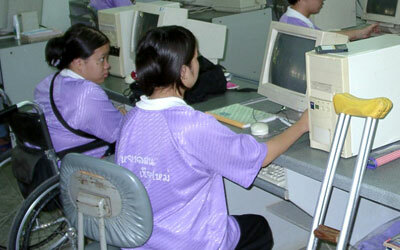 The computers which are still used at the center are old, partly not working anymore and are insufficient to train for today’s needs. At least 20 more are needed, including scanners, printers and new screens. I will end this short information regarding the Yardfon Vocational Rehabilitation center with the same words as Dr. Iain Corness ended his personality column. “The world needs more Mayuree’s”. Thai Hotels Association (THA) Northern Chapter held its 23rd Hotel Sports Day at the Municipal Main Stadium to celebrate the association’s 40 year anniversary. 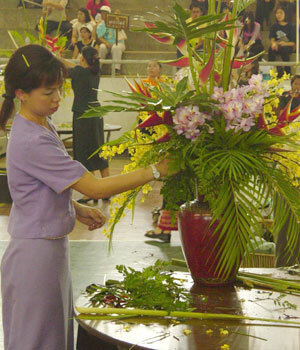 The flower arranging event was won by the Regent. 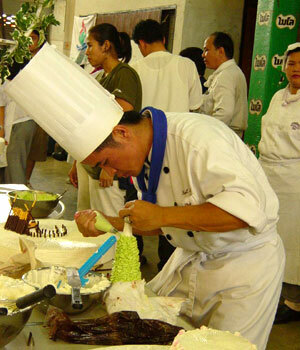 Staff from the Empress Hotel, shown here concentrating on cake dressing, eventually received second prize in the event. If you’re really, really thirsty, these are the guys to call to get your wine in a hurry. Competitors concentrate on not spilling a drop as they head down the straight stretch and into the chicane, trying to earn the title of “fastest wine server in the north”. The opening ceremony was presided over by Udornphan Chantarawiroj, president of Chiang Mai Provincial Administration Organization and by Miss Thailand 2003, Chalisa Boonkrongsap who kicked off the friendly football match. Visitors were treated to many types of hotel ‘sports’ such as wine serving, European dining table arrangement, table skirting, single and honeymoon bed making, flower arrangement, wedding cake dressing, ice carving, fruit carving, and a tug-of-war, won by Lanna Palace Hotel. The event wasn’t restricted to only Chiang Mai hotels, and there was great participation from hotels in other provinces, with the Golden Triangle Paradise Resort coming first in women’s table skirting and Rimkok Resort and Spa, Chiang Rai for wine serving. The Sports’ Day ended with a party at the Imperial Mae Ping Hotel hosted by Vorapong Moochaotai, THA Northern Chapter president. 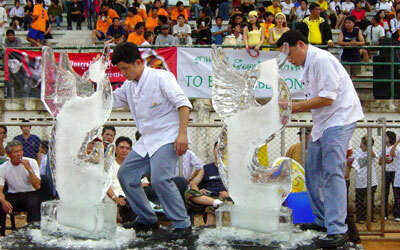 Cool under pressure, the ice carving competitors hack away at a block of ice, magically transforming it into a beautiful ice sculpture. 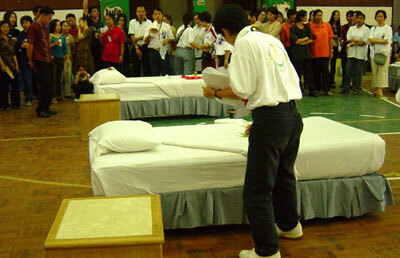 Competitors work up a sweat during the honeymoon bed making competition. Fruit Carving: Imperial Mae Ping, Lotus Pang Suan Kaew, Suan Bua Resort. And if you want to be happy for one hundred years, you should do gardening! That is the reason why I want to tell you about the advantages of gardening – a simple, relaxing hobby in your life that has more benefits than you think. The main advantageous results you will obtain from gardening are your healthy body and mind, an economical life, a safe environment, and a socially active community. Torch Ginger - Latin name “Protea” – looks pretty and lasts a long time. If you want to be both physically and mentally healthy, gardening is your alternative approach that you should consider. Firstly, eating fresh, non-toxic vegetables provides your natural fiber, which is good for your digesting system. Moreover, herbs can be used as medications for sickness. Watering your plants is a good exercise that makes you relax. A beautiful garden brightens your mind as well. Gardening is not only profitable for your body and mind, but also a good solution for your economics and the environment. It is cheaper to plant your own vegetable, and it can be another source of supplemental income. Furthermore, plants can be a nice gift. For the environment, plants in the garden are an affective oxygen producer, cleaning the air you are breathing. In gardening process, planting your own vegetables needs less pesticide, and natural fertilizer used for gardening makes soil better, too. Lastly, gardening can be one way for you to reach out to or to interact with your community. If every family does gardening, the community will have more beautiful scenery. 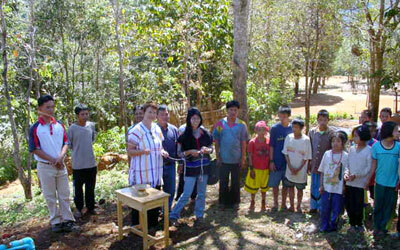 And by exchanging knowledge and ideas about gardening, it helps to promote good relationships among the neighborhood. Gardens can also be a learning place for children. They can learn to be responsible by growing their own vegetables, learn to protect their environment, and learn to appreciate nature. 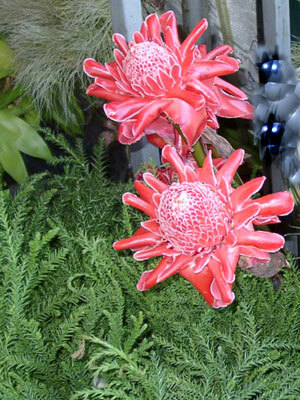 In addition, beautiful botanical gardens can promote tourism in the community. I know, I know. You are one of the people who want to see everywhere green. You are dreaming about having a little garden, eating fish greenish salad from you backyard, using natural herbs instead of going to see your doctor every time you get sick and waiting for another chit-chat with your neighbors while you are watering you plants. Doesn’t your heart feel happy just thinking about all those things? If you do not have the garden in your house yet, what are you waiting for? It is time to do ‘Gardening’! I lay on my back, floating in the warm primordial fluid of the sea, the hot breath of the sun caressing my face. I stretch my limbs taut and exhale, feeling myself rise then relax my muscles and inhale, allowing my body to fold and slowly sink into the clear blue waters of the Andaman. Holding my air deep inside, my hair floating around my face like waving sea fans, I open my eyes and watch small silver fish flash in the sunlight, flickering around my legs then disappearing with quick twists of their lithe bodies. I watch until my lungs feel like they are on fire then kick my feet and shoot upwards, breaking out of the ocean with a gasp of air. The limestone cliffs, karst formations and caves that fall right into the ocean make the area an extraordinarily beautiful place to explore. The giant orb sinks beneath the horizon, pulled down slowly by the force of the sea to be swallowed whole by Neptune himself. Treading water, I gaze around me at the majestic limestone mountains that surround Railay Beach in Thailand’s southern province of Krabi, marvelling at their formations, which appear like they have been carved by hand. I look to the palm-fringed beach of Hat Railay West, or Sunset Beach, the golden sand glowing softly in the late afternoon light. My boyfriend waves to me from our sarong laid out under the shadow of a broad-leafed tree, with piles of books and bottles of water. I wave back then swim slowly towards him, the water streaming between my fingers like silver fish. Railay Beach is a haven for travelers seeking the excitement of climbing limestone cliffs, sea canoeing and kayaking, cave exploring and diving. Railay Beach, which is divided into two beaches, Hat Railay East and Hat Railay West, is a haven for travelers seeking the excitement of climbing limestone cliffs, sea canoeing and kayaking, cave exploring and diving. The geology is perfect for such activities. Not only does the pristine clear sea and coral reefs offer excellent scuba diving and snorkelling, the limestone cliffs, karst formations and caves that fall right into the ocean make the area an extraordinarily beautiful place to explore. Tidal erosion and wave action have created overhangs so that you feel like you’re swimming or kayaking right under the colossal blocks of stone, while erosion by heavy rainfall has formed caverns covered with stalactites and even giant chambers called hawngs, created when the ceiling of caverns collapsed. 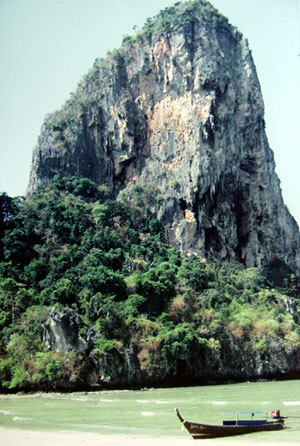 We arrived on Railay Beach a week ago by long-tail boat, which we caught from the Chao Fah pier in Krabi town. The supposed 45-minute journey took more than an hour as we were met by heavy seas and high waves. By the time we began approaching Hat Railay East, the sky was darkening and our bodies and bags were soaking wet from the frothing waves crashing into the narrow wooden boat. Our captain, a thin older man with lined leathery skin and a worn baseball cap, handed my boyfriend a tin can to scoop the water over the side. But his effort was fruitless. For every can of water he tossed out, another wave washed in. 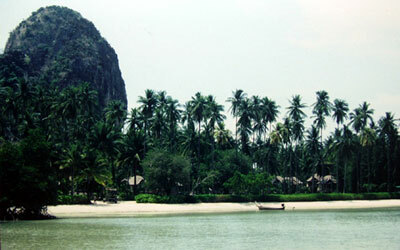 Thinking about our wet clothes, journals and cameras, I began wondering whether this trip to Railay Beach was worth it. Dusk was settling in deeply and I was shivering with cold. But then suddenly, the canvas of the sky metamorphosed into a landscape of colour, as if an artist had pressed his brush into the back of the canvas so that the colour bled through the fabric to meet our eyes on the other side. Pinks and oranges fused with reds, yellows and purples, so that the entire sky was on fire. I changed my mind. As the hues above paled darkly, the bow of our boat slid up onto the sand of Hat Railay East. At last on land, we pulled our drenched bags onto our backs and, with a wave to the captain who had to make his way back to Krabi town in the blackness, headed off into the night in search of a place to sleep. I squeeze the water from my hair and settle back down on our sarong on Sunset Beach, facing the sun as it slips closer to the sea. I scrunch my toes into the soft sand, and smile as I lean my wet head against my boyfriend’s chest. We are silent, waiting patiently, while others, oblivious to the sea which is now the colour of ripe papaya, continue to chat animatedly in clustered groups or lie on the sand with their eyes closed, feeling the last tendrils of heat on their backs. The sun shines a glittering path along the ocean’s surface right to the water’s edge so that the light sparkles like jewels on the waves, and soon conversations slow in tempo and cease, as all eyes turn to gaze at the dazzling view in front of us. The giant orb sinks beneath the horizon, pulled down slowly by the force of the sea to be swallowed whole by Neptune himself. As the limestone cliffs on either side of the beach darken to a gentle velvety blackness and wispy clouds glow with gold, the sky and sea silently deepen to the colour of blood, a hue so vibrant and rich, gasps of amazement are carried on the gentle, sweet sea breeze. For several minutes we watch as the fingers of red extend like northern lights over our heads to the far reaches of the sky in the east, as if to entice the sun to rise again. As the sun sinks lower into the abyss, the sea and sky soften to a dark wine, stars begin to dot the heavens, and black waves crash onto the shore, the scent of salt and evening flowers heavy in the air. With a sigh of contentedness and tranquility, we collect our things and return to our bungalow, to wash the sand and salt off our skin, and dress for the night. 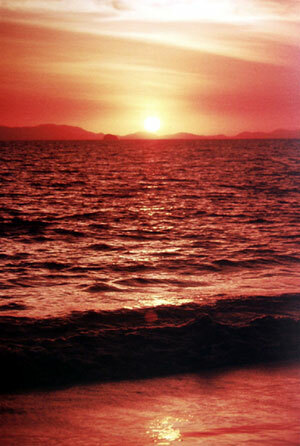 Another dreamy day on Railay Beach spent, our memories linger in anticipation of another breathtaking sunset tomorrow.